I have walked to the Bone Caves many times with my family on holidays. 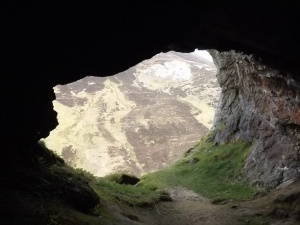 This time I did it alone, which felt a little strange but did allow me to take a further wander up the Glen beyond the Bone caves for a short while….this section is not included in the walk details below and though it was very enjoyable its not recommended with children. The Bone Caves walk takes you up the Glen of the Allt nan Uamh (Burn of the Caves). Start from the Allt nan Uamh car park, about four kilometres south of Inchnadamph. 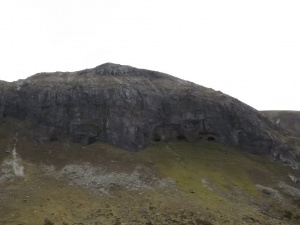 About 800 metres from the car park, you reach a small crag to the left of the path, and the first view of Creag nan Uamh (Crag of the Caves) appears. Look at the river. 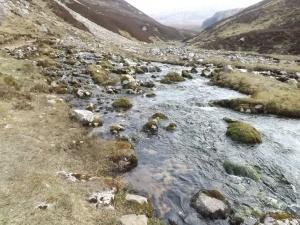 Most of the water doesn’t flow from higher up the glen instead, it is appearing from almost beneath your feet. 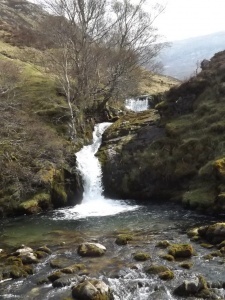 This is a big spring, the Fuaran Allt nan Uamh. The limestone in this area is so permeable that the water flows through it in a series of caves and cracks. My boys were always amazed at the full flowing river suddenly dissapearing upstream….it became known as the magic river. The river bed above the spring is dry, except during heavy rain, when the underground system can’t take all the water and it flows on the surface. About 500 metres beyond the spring, cross the dry stream bed and climb up to the Bone Caves. There are four caves, formed thousands of years ago, before the last ice age, as water gradually dissolved the limestone along cracks and faults. Over thousands of years, the glen has deepened, cutting away part of the cave system, and leaving the caves as we see today high on the side of the glen. Digs here have found the bones of wolves, bears, lynxes and arctic foxes. Reindeer bones and antlers have also been found. 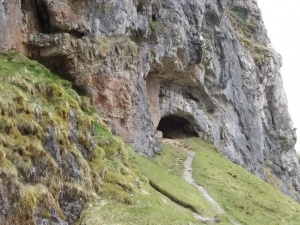 Human artefacts and bones have also been found in the caves. 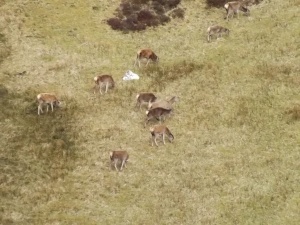 Nowadays its just red deer that are the common sight in the glen. This glen is very popular with cavers. The Bone Caves do not go far into the hillside, but the entrance to the longest cave system in Scotland, the Uamh an Claonaite, is nearby. From the caves, follow the path that continues beneath the crag. 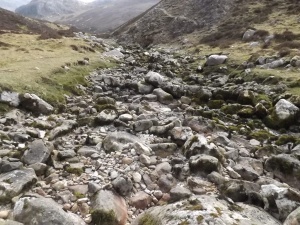 This path drops down, crosses the sometimes flooded dry river via stepping stones and then follows the river back down the glen.Rejoin the main path again at the fork. The whole walk takes approximatly 2 hours. Upgrades @ Stoer in the north west highlands. A very busy winter, with lots of upgrades being done at Stoer Bay Chalets. we have some before and after pictures of what we have been up to. Luckily for us the weather has been very kind of this past winter, allowing us to get so much done. We were very fortunate. The final push this last weekend was in glorious sunshine so although our energy levels were dropping the sun definatly gave us an energy boost. The lower photo showing our new beautiful Siberian Larch cladding to Mijbil & Edal. Meanwhile, Tarka decided to develop a rather large unrepairable leak in her Patio doors and now proudly dispays her new upgraded wind and watertight new sliding patio doors, also making life easier if you wish to go out on the deck when there is a wind, no change of a door getting pulled out of your hands unlike the old patio doors. We did a little work inside too and though all the chalets were all redecorated last winter. Tarka’s twin room had been neglected due to time issues so we are delightes with her new look. She also aquired a beautiful dining table & chairs. Edal not to left out decided she would quite like a new oven. It shouldn’t take quite so long to cook your tea now that she has a shiny new oven that heats properly as well as a couple of tub chairs to relax in, in her lounge. So as you can see its been busy busy and all done just in time for our first guests of the new summer season arriving next week. 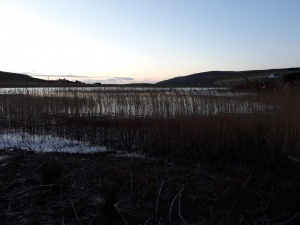 So now we are hoping to relax a little and enjoy meeting and greeting all our 2019 guests and maybe even get in a little bit of walking and enjoying the scenery, maybe even a dip into the Minch….later on in the summer. Suddenly things are becoming a little hectic in Stoer. Though Mijbil is completely reclad and all the little snags done. Edal still needs round some of her windows finished off but is otherwise all ready. This will need to be put on hold for a weekend. One being Tarka’s new patio doors arrived. These needed fitted as soon as possible for guests arriving shortly. There may be a very faint smell of paint but will be done. Two. An Olympic high jumping sheep that seems capable of jumping 5 foot fences. Unfortunatly, some rotten posts did not withhold this abuse. So what was going to be a job for this summer has now hastily had to be brought forward and also needed started last week…. to finish this weekend. Ensuring secure fencing once again around the chalets. So a bit of a list for this weekend then all hands on deck to get Edal finished. It has been a very busy winter. We have for what we needed to get done been so lucky weather wise. Edal and Mijbil have had all their rotten wood cladding and broken roofing gone and replaced with lovely new roofs. Thick Siberian larch cladding making them snug and cosy once more. A new carpet and Sofa in Mijbil’s lounge will finish her off. Tarka has a new dining table and chairs and lovely watertight and draught free sliding patio doors ( also much handier in high winds). We are looking forward to a brief rest before our first guests arrive! We are now (just about ready) to start our second summer season and are once again looking forward to meeting some already familiar faces and new ones….and possibly getting the odd Sunday off. A wild weekend in Assynt. Well, what a wild and windy weekend we had this past week. Heading up the road to the chalets on Friday night. We stopped to let this wee chap cross the road in front of us. Spent ages watching him snuffling about for ages before wandering off into the dark. We woke to a beautiful morning. Before to long the sun was out and we ranted briefly about the weather forcast prediction of gale force winds. This information had made us last minute cancel the weekends agenda of fitting Tarkas new patio doors. So got out the paint brushes instead. So fooled by mother nature! Wind and rain commencing before any paint had a chance to even start to dry. Bringing an almost comic set of us running madly to try and find things to protect said items. The rest of the day was spent pottering with small but just as essential jobs. New curtains hung, little bits & bobs fixed indoors. We also had to rescue a poor toad who had fallen and was trapped in a drain. Broken drain covers now replaced to prevent this rehappening, especially right now. All the toads are very actively in the midst of mating season. 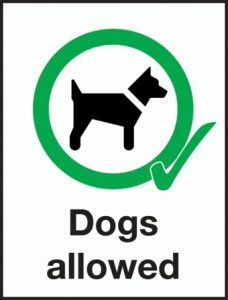 For being pretty rare creatures they are certainly in plentiful supply around this area at this time of year. The gales picked up dramatically over night, the howling and roaring waking us up in the middle of the night sounding like some demented beast as we lay snug and cosy. So thankful that we had new walls and roofs to protecting us. The morning bringing still more rain though it had eased a little, the wind had almost completly dropped warenting a wander over to the bay to carry out my favourite pasttime – wave watching. Still quite impressive so could only imagine the size they must have been through the night. The beauty of this place never dissapears just changes depending on mother natures mood. Stoer Bay Chalets, Self catering, Beaches, Rainbows and beautiful skies. Its been a very busy winter once again at Stoer Bay chalets. With both Mijbil & Edal almost completly reclad. Just 1 porch to finish, some facings round doors and windows and a couple of snags and all done…..sounds so easy on paper! Not to be left out Tarka’s new patio dooors have arrived, so thats the next job already waiting, no rest for the wicked! It has been a unfeasably mild winterthis year, which, as much as I love the snow, has helped us tremendously in even managing to get all this outside work done. We are just grateful that we didnt do this job last winter. That would have been a whole different story. We also had some lovely friends up for a visit last weekend. 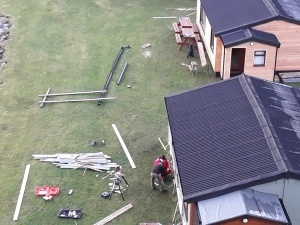 They hadn’t been up since we first bought the chalets 15 months ago. It definatly helped us feel on track seeing their faces at the changes since their last visit. It was also lovely to sit in the evening and chill with a few wee drinks and relax in a place that is so special to us and share it with such good friends. The warmer weather has of course brought with it the inevitable rain but this brings its own beauty in the form of rainbows. But, this is the west coast of Scotland, we are not going to let a wee bit of rain stop things from getting done! Apart from stopping to take photos of course. The early morning sun creaping round to the bay. I thought it would be a good opportunity to look back on last year. With plenty work always going on this lovely Autumn afternoon walk was a great few hours gentle stretch of the legs. Clachtoll to Stoer via their peat tracks. A beautiful 6 mile circular walk through the old peat cuttings with amazing views at every corner. Leaving from the chalets I will take you along the road going left through Clachtoll, up the wee steep hill leaving the hamlet until you see the sign for the peat track on your left. There is a clear cart track with stunning views and looking closely the peat cuttings even though now disused and filled with regrowth of heather are still clear to see. If you are lucky you may spot some red deer on the hills. The track tapers down further on and narrows into a small path. As you swing round to the left you can clearly seen wooden posts direct the way through this pretty boggy part of the route. The path goes sharply down briefly to some of the small lochs at the back of Stoer before flattening out and rejoining the Stoer track. You wander along until you come out behind the small group of houses approximatly half a mile beyond the main hamlet of Stoer. Once you join the tarred road turn left and enjoy the views until you reach the chalets once again. The route can of course be done the opposite way too. I was in no hurry, savouring the fresh air and freedom. This walk would make a lovely half day wander. A gentle walk, mainly flat with just one very brief steep point. A belated but heartfelt Happy New Year to everyone. We hope you had a lovely time celebrating in 2019. I sadly haven’t been to the chalets for a couple of weeks. David & Ben though have been up and it sounds like all is going well with Mijbil, her makeover is almost complete. Finishing touches are this weekends job before it’s Edals turn . There has also been our first significant fall of snow of the winter this week. We always look forward to seeing the mountains in all their beautiful winter glory….nothing can look as stunningl as a snow shrouded mountain. Assynt may not be reknown for many high mountains ( there are only 2 munro’s ) but they still make an extraordinary landscape, with fantastic, individual shapes. These mountains are loved by walkers all over the world and the following are reviews of just a few of them. 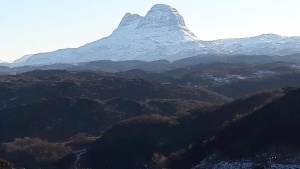 Suilven The area’s most distinctive mountain which rises abruptly from the beautiful landscape. The views from its top are stunning. 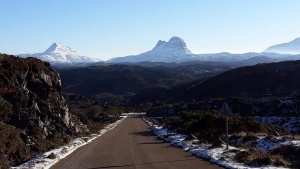 It is not an easy climb as it is remote from any road, so both the approaches, from near Lochinver to the west and near Elphin to the east, are long and are boggy in places. Many nowadays will use mountain bikes for the approach. The summit ridge is reasonably easy once you have finished the tough scramble to the saddle in the middle. 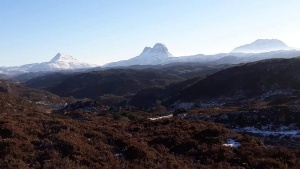 Quinag: a majestic mass looming over the sea loch in the north-west. Superb views. Ben More Assynt & Conival The only Munros in Assynt, these two rocky mountains are connected by a ridge. Together they give a very rough but rewarding ascent with amazing views, a good, long walk from Inchnadamph. Stac Polliadh This solo sandstone mountain shows how amazing Scotland’s small mountains can be In a mere few hours you get a fun thrill of a walk. The views all around are gorgeous. Quinag: a majestic mass looming over the sea loch in the north-west. Amazing views. 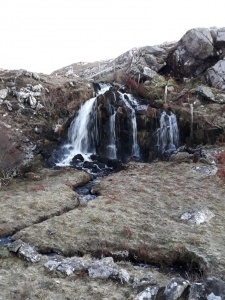 To find out more information on these and other climbs, following the link on our website’s Activitie’s page to Walkhighlands.